Moose (Alces alces americana) are provincially designated as an endangered species on the mainland of Nova Scotia, and the Canadian Cooperative Wildlife Health Centre, Atlantic region has recently received a carcass and tissues from two of these endangered moose. Both individuals were exhibiting neurological signs such as incoordination and an inability to use their legs. A parasite known as Parelaphostrongylus tenuis was identified in the brain and spinal cord of these moose and accounts for the neurological problems they were experiencing. The disease this parasite causes is called “parelaphostrongylosis” and is more commonly referred to as “brain worm”. 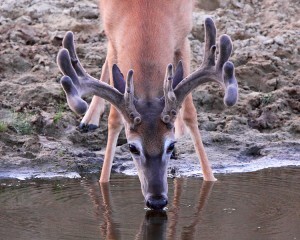 White-tailed deer are the normal final host for P. tenuis, and it does not cause disease in this species. The parasite’s life cycle is complex and involves a snail or slug as an intermediate host. The parasite’s eggs are passed in the feces of the white-tailed deer, and the parasite’s hatched larvae infect snails or slugs when they crawl over the deer’s feces. Subsequently, infected snails or slugs can accidentally be eaten by white-tailed deer when they are feeding on plants. Once in the white-tailed deer’s digestive tract, the P. tenuis larva leave the snail or slug and make their way to the covering of the brain where they develop into adults to complete the life cycle. The only time a problem occurs is when another herbivore (eg., moose, caribou, elk, sheep, goat or llama) eats an infected snail. In these animals, the parasite penetrates the tissue of the brain and/or spinal cord and does a great deal of damage while continuing to move around in these tissues. It is this damage in the brain and/or spinal cord that causes the neurological disease identified in cases of parelaphostrongylosis. Wild species often lose their fear of humans and all species can become uncoordinated, travel in circles and completely lose the use of their limbs. Because of their neurological problems, affected animals often do not eat and become emaciated. They also become easy prey for predators and are prone to collisions with vehicles. 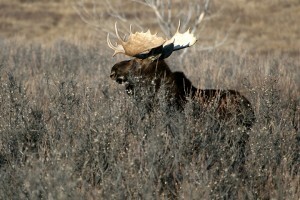 Parelaphostrongylosis is implicated as a factor in the decline of the mainland moose population of Nova Scotia. Therefore, the Nova Scotia Mainland Moose Recovery Team is discussing possible management strategies to reduce the impact of P. tenuis on the provincially endangered moose population. If you encounter a sick moose in Nova Scotia please report it to the nearest Nova Scotia Department of Natural Resources Office or call the Canadian Cooperative Wildlife Health Centre, Atlantic Region at 902-628-4314.